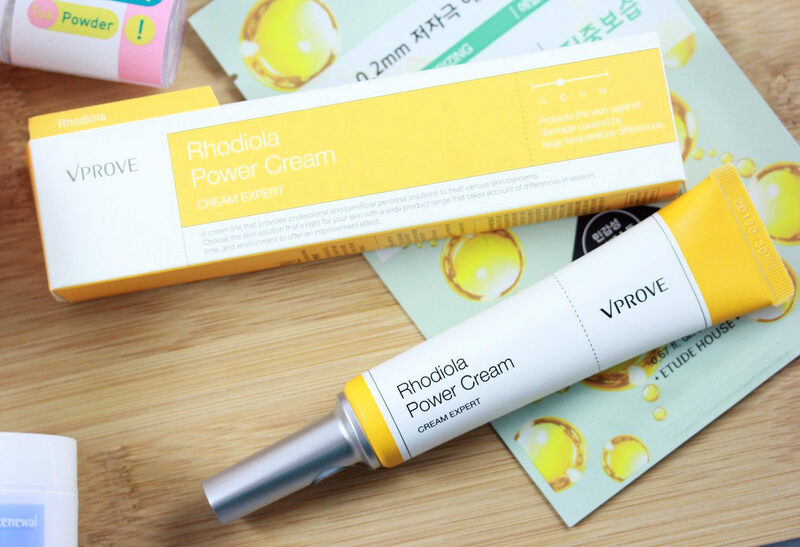 Another skincare review on Nailderella :D and it's about a relatively new Korean brand that has just landed at Jolse.com. 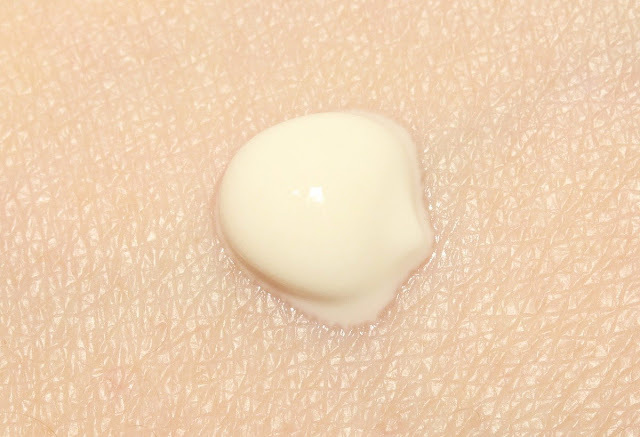 I received this cream from Jolse for review puroposes. 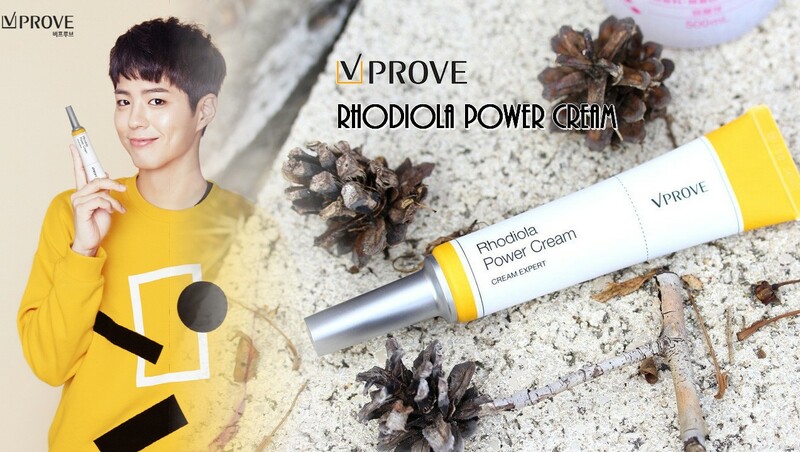 VProve is a new Korean brand that is endorsed by the actor Park Bo Gum. I think the brand actually launched last October, so yes fairly new! The brand offers a lot of different products but seems especially famous for their creams. They have the following ones: azuelene, panthenol, zinc oxide, peptide, multi vitamin, anti-wrinkle, mattifying, and rose veil cream. You can see them all on jolse here. They also have some ampoules which seem interesting, such as a propolis, aloe, astaxanthin, betaglucan, peeling ampoule, etc and some oil ampoules, too. Claims: Temperature-overcoming cream that strengthens the skin's natural power to prevent it from being sensitive due to big differences in indoor and outdoor temperatures. Rhodiola is a plant that is able to grow in the harshest environmental conditions of the world, especially in very cold climates. Rhodiola has been categorized as an adaptogen due to its observed ability to increase resistance to a variety of chemical, biological, and physical stressors. The adaptogenic agent allows our physiology to handle the stressful situation in a more resourceful manner. 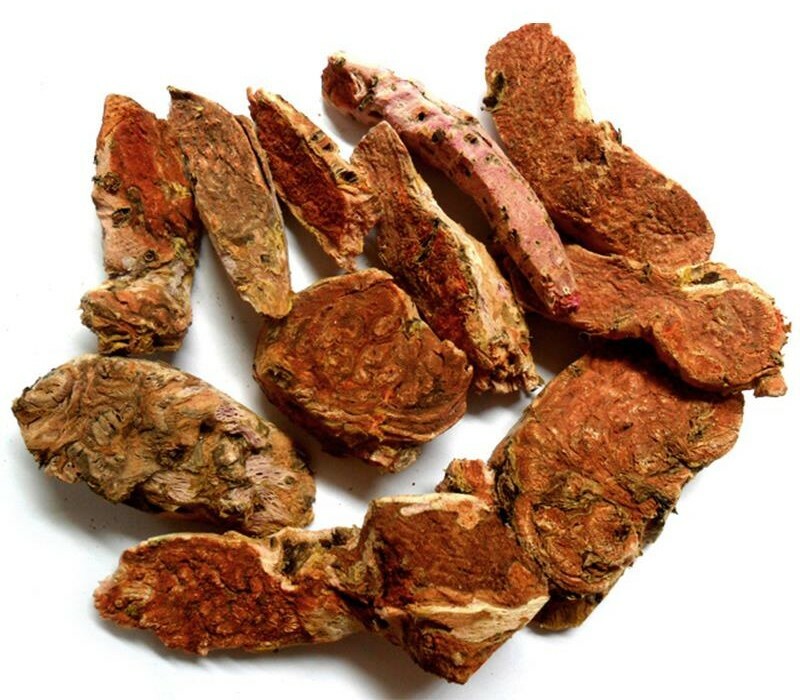 The stimulating and adaptogenic properties of Rhodiola were originally attributed to two compounds isolated from its roots, identified as p-tyrosol and the phenolic glycoside rhodioloside. 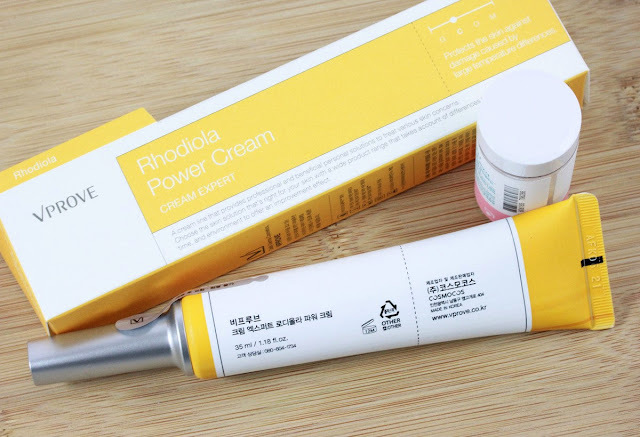 Rhodiola rosea seems the species the most studied but these 2 important molecules are also present in Rhodiola Sacra, the species present in this cream (1, 2). 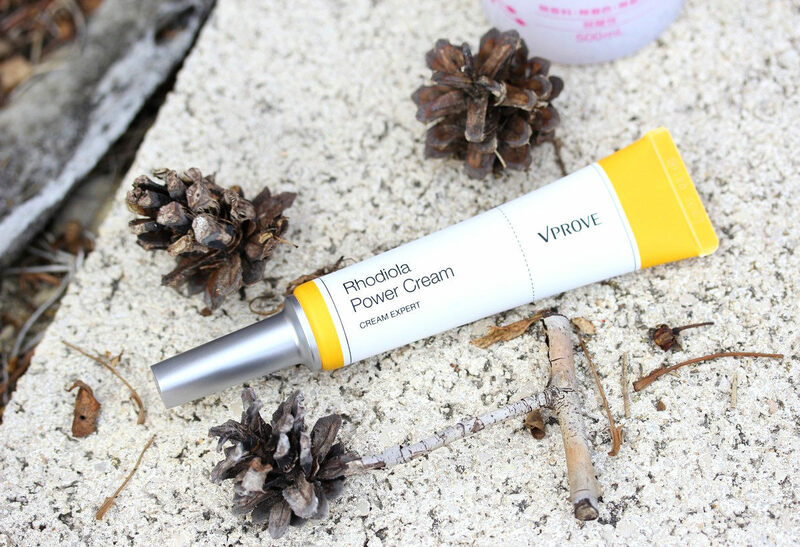 The adaptogenic properties of the plant has been used as the main claim of this cream: it’s supposed to protect the skin against damage caused by large temperature differences and therefore could help your skin adapt to different conditions. These adaptogenic properties are observed mainly after oral administration. Concerning topical applications, what is intersting is that this plant is super rich in strong antioxidants (flavonoids, phenolic acids) and is therefore beneficial in that sense, i.e. 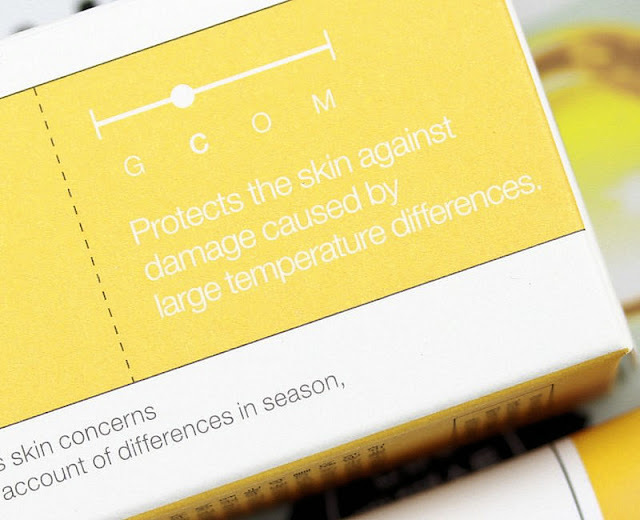 to protect the skin against environmental assaults (3, 4, 5). 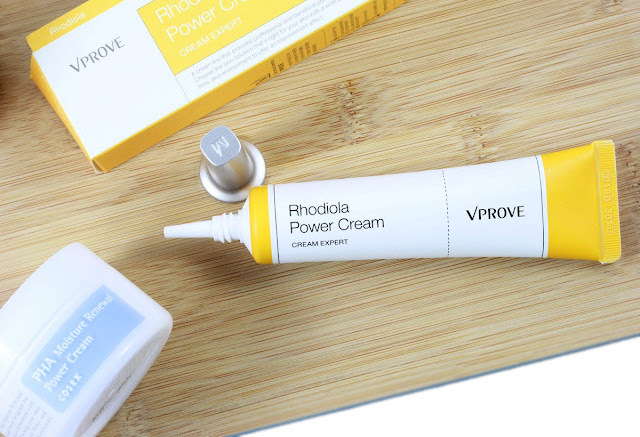 So the main benefit of topical applications of Rhodiola is its powerful antioxidant properties (but I can’t say if its antioxidant ability is stronger than in other botanical extract as it depends on too many factors). The cream comes in a 35mL plastic tube. I like how sleek it looks and I also like the details, for example look at the cap. I think it looks different from what I've seen before and I like it. It's also great that the tip is small, it protects the cream well and limit the degradation of the precious ingredients. It is a medium consistency white cream (it comes too yellow in my pictures, sorry) that is moisturizing but it doesn’t feel too rich. It’s easy to spread and it dries down to a matte finish with a natural sheen. It doesn’t feel sticky and is absorbed quite fast. It has a rather strong fruity-herbal scent (not sure how to describe it) that lingers for about 15 min. The scent actually doesn’t bother me as I like it. It’s hard to tell because I’m fair but it’s not impossible that on darker skin tones, it can slightly whiten the skin or make the skin looks slightly lighter, I’ve got the impression that the amount of titanium dioxide in it is significant and that it could therefore create this effect. Water, Dimethicone, Hydrogenated Polyisobutene, Rhodiola Sacra Root Extract, Butylene Glycol, Propandiol, Niacinamide, Cyclopentasiloxane, Carthamus Tinctorius (Safflower) Seed Oil, Cetyl PEG/PPG-10/1 Dimethicone, Cyclohexasiloxane, Butyrospermum Parkii (Shea) Butter, Biosaccharide Gum-1, Glycereth-26, Sodium Chloride, Aluminium Starch Octenylsuccinate, Titanium Dioxide, Sorbitan Isostearate, Ozokerite, Aloe Barbadensis Leaf Juice Powder, Panthenol, Dextrin Palmitate, Jojoba Esters, 1,2-Hexanediol, Caprylyl Glycol, Portulaca Oleracea Extract, Madecassoside, Allantoin, Ethylhexylglycerin, Disodium EDTA, Adenosine, Aluminium Hydroxide, Sodium Hyaluronate, Beta-Glucan, Prunus Mume Fruit Extract, Glycerin, Zinc Oxide, Panax Ginseng Root Extract, Magnesium PCA, Sodium Lactate, Tocopherol (Vitamin E), Copper Tripeptide-1, Serine, Sucrose, Urea, Glycine, Calcium Chloride, Potassium Hydroxide, Ornithine, Sea Salt, Alanine, Magnesium Chloride, Threonine, Histidine, Aspartic Acid, Valine, Proline, Dispotassium Phosphate, Lysine, Tyrosine, Leucine, Phenylalanine, Isoleucine, Glucosamine HCl, Magnesium Citrate, Asparagine, 1-Methylhydantoin-2-imide, Glutamic Acid, Citrulline, Arginine, Uric acid, Methionine, Tryptophan, Taurine, Glutamine, Cysteine, Phenoxyethanol, Fragrance. There are a lot of ingredients in this cream so I’ll go up to the preservatives and stop there. The main ingredients are solvents (water, butylene glycol), texture modifying agents and emollients such as some silicones (dimethicone, cyclopentasiloxane, Cetyl PEG/PPG-10/1 Dimethicone, cyclohexasiloxane) and hydrogenated polyisobutene which is a thick emollient and moisturizer that prevents water loss. In 4th position comes Rhodiola Sacra Root Extract (antioxidant)! Importantly we have niacinamide, it can improve skin’s elasticity, enhance its barrier function, stimulate microcirculation, help erase discolorations, and revive skin’s healthy tone and texture (i.e. it’s brightening). Then we have more emollients, such as Safflower Seed Oil which also has antioxidant properties, and shea butter. 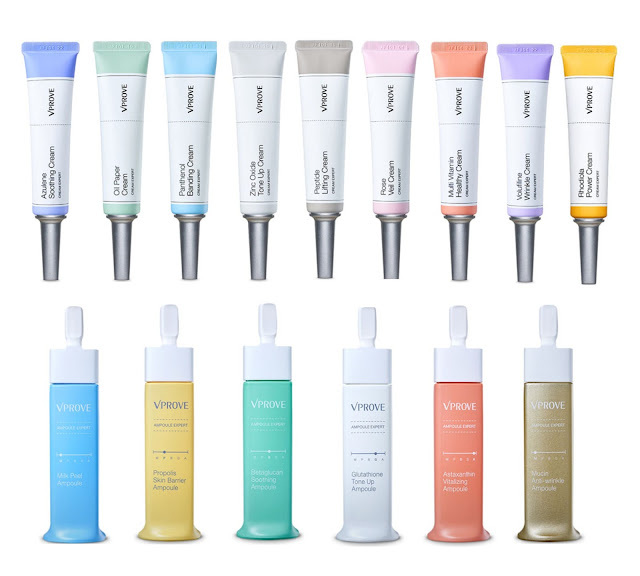 Then comes a bunch of functional ingredients: some additional emollients, thickeners, texture enhancers, emulsifiers. We can note the presence of a few ingredients that will make the texture thicker and whiter, such as Titanium dioxide, Ozokerite (a mineral wax), and Aluminium Starch Octenylsuccinate (it’s an absorbent that gives a powder-like matte finish and fast dry time). Some ingredients with soothing (Biosaccharide Gum-1, aloe, Portulaca Oleracea Extract) and anti-inflammatory or wound healing (Panthenol, Madecassoside) properties are also present. Overall this is an emollient cream with a nice slip, it’s therefore easy to spread. It has a white opaque texture, feels moisturizing and leaves the skin matte with a natural sheen. Main beneficial ingredients, in addition to all the emollients, are Rhodiola extract (antioxidant), niacinamide (anti-aging, improves skin’s elasticity, brighten and even the skin), some soothing and anti-inflammatory ingredients. So in terms of ingredients, I think it’s not bad at all, there aren’t many possible irritants (the only one marked as potential irritant according to cosdna is tocopherol and it seems to be present in low concentration), and the formula seems overall quite gentle (see cosdna analysis). What I appreciate less is the large amount of functional ingredients, they could have use less in my opinion. Despite all the emollients, I don’t find this cream super moisturizing, it is moisturizing but not as much as I first thought it would when I saw the texture and ingredients. It dries down to a natural matte finish and feels refreshing when applied. I find it therefore really appropriate for a day cream. That said, I noticed that at the end of the day it made my skin slightly greasy, especially if I use too much of it. If you have oily skin, it’s possible it would make you oiler and for very dry skin, it will be not enough. I would say that it works best for combination to normal skin types. The scent is also quite present, it’s a fruity-herbal scent (not sure how to describe it), I personally like it! It does linger a bit so if you don’t like fragranced products, be aware of that. Finally I I like that Rhodiola root extract is present in the cream in what seems a good quantity. I don’t think I would repurchase it because it’s an ok cream but not the best I’ve tried so far. I'll continue using it from time to time in the morning. 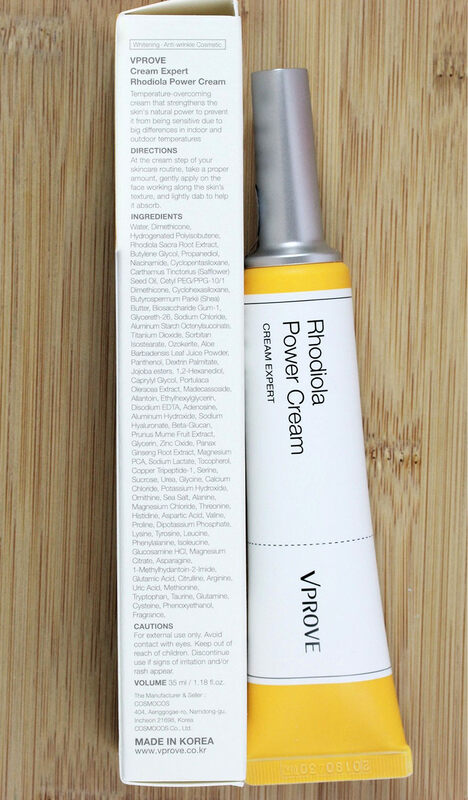 However, VProve has different ampoules that seem pretty interesting and that I’d love to try. 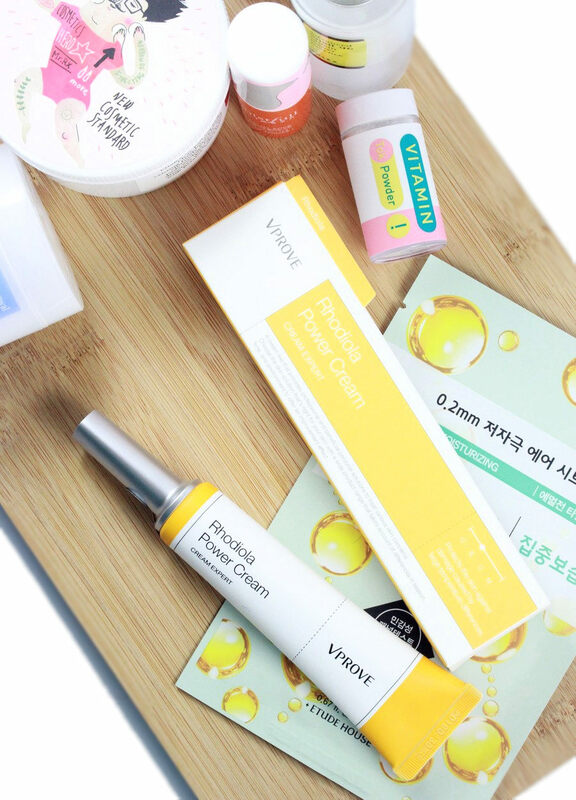 VProve products can be purchased from Jolse.com (one of my all time favorite store for K-beauty products, they offer free shipping and ship internationally). 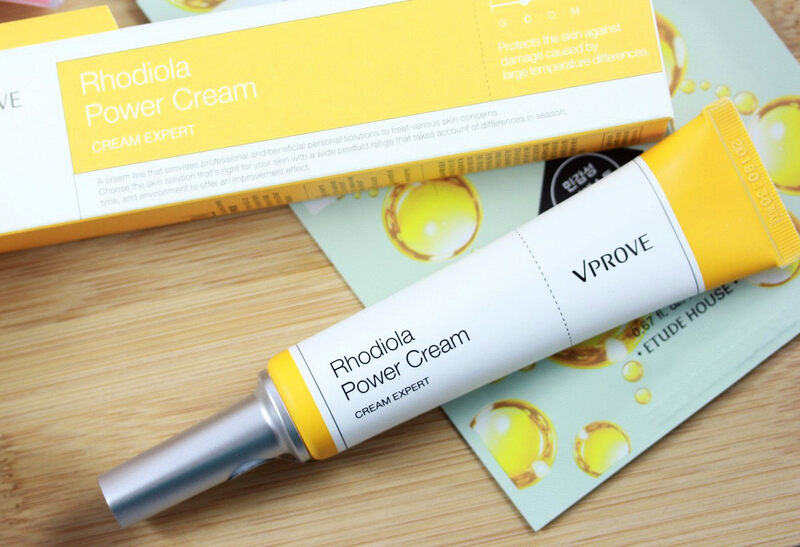 Link to the Rhodiola cream. Thank you, my dear! I also love the concept, all the ingredients and that Rhodiola is present up in the ingredient list! but yeah for me, it's an OK cream but not a wow-one :p I need to test one of their ampoules though, the propolis one seems great! Thank you. The cream is alright but nothing extraordinary in terms of texture and feel but I will still use it. Thanks a lot, so happy to hear that! Hi Emilia, thank you for your comment. I also like the smell of it! ;) Good to hear it works great for your skin! Oh my gosh, I think I've fallen in love with these products already. Look at that packaging! !